There are several reasons why these cheap Bluetooth speakers are very practical and why you should buy them. They are portable, and if you need higher quality sound wherever you go, they are the ideal solution. In most cases, they are much better than the built-in speakers with the vast majority of devices. They don’t use cables (but they do have that option because most of these Bluetooth speakers come with a cable – 3.5mm jack), they are wireless. They are also easily connected to devices and don’t occupy much space, they are quite resistant, you can buy them in different sizes, colors, materials, etc. 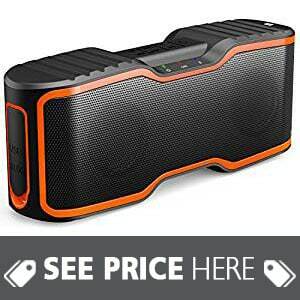 This is the main reason we have selected the Top 10 best cheap Bluetooth speakers under 50, just to make your choice a bit easier. High-quality sound, speakerphone, easy touch controls, long battery life, high-quality sound. These speakers are produced by the well-known manufacturer DOSS. They use touch technology with latest wireless Bluetooth 4.0. They’re portable, the speakers offer HD sound and they uses two 6 watt drivers with 360 degree bass and sound feature. Very low level of distortion, up to 1%. The battery life is great because even if you pump up the volume up to 75% you can still use it for about 12 hours. Very fast and easy recharging which can be useful when you`re out of battery and you need to use it. You can recharge it quickly and have it ready to use in no time. With the help of a micro USB charger it takes only 4 hours to recharge completely. The touch controls are located on top of the DOSS speaker. Everything is very easy to handle thanks to the modern touch design. The touch control is extremely sensitive and you can adjust the volume, speakerphone, skip or rewind tracks, etc. Thanks to the new Bluetooth 4.0 technology it’s very easy to pair them with any device, even when the distance is 33 feet (10 m). They have a speakerphone option, so you can use them even for conference calls or to chat with your family, friends and all that in HQ sound. You can buy them in several colors: blue, red, white and black according to Amazon. Quite portable with smooth edges. The whole product is wrapped in a solid aluminum case. It doesn’t bend when you press it. The top and a bottom are a matte finish, simple and classy. When turned on, the button lights up white and a blue circle appears in the middle. This blue ring is also touch sensitive and it’s used for volume adjustment. On the back, you have four important things. First, you have the on-off button, then the audio cable line in, the micro SD card slot (TF card) and the micro USB charger. When you plug in a micro USB charger, a small light is turned on, just below the charging port . Very good built quality and design. The mid range is clear and clean. The high tones are OK. Plenty of sound for a small and mid size room. Some people complained that they had a problem connecting to some devices at a greater distance. 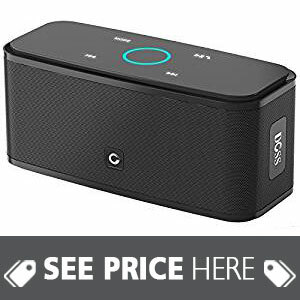 Compared to competitive products of this type, the DOSS Wireless Bluetooth Portable Speaker is great. It has great sound, the bass is pretty good, though not perfect. It’s beautifully designed, made of durable materials. You can choose from 4 colors. High definition sound with very good bass performance guarantees and you will fall in love with them very quickly. The touchscreen brightness is great, some might even say it’s too strong. Everything said, we really like it. This model has a very attractive design. It’s waterproof, with a very strong 20W sound. The first thing we noticed is that this Bluetooth speaker model is waterproof and uses the IPX7 standard. This means that it’s not only resistant to light rain or water splash, but that it’s really resistant to a serious amount of water. According to the manufacturer, you can immerse it in water for up to 30 minutes at a depth of 1m. Very impressive isn’t it! The sound is precise, the quality is high, too. It uses 20W powerful sound. It has the option of wind reduction and noise reduction and a very clear, almost crystal clear bass that is very well balanced, but not especially strong. It has a robust design. The other good thing is that it’s made of high quality, durable materials. The speakers are covered with a rubberized material that surrounds them. This is a good protection against shocks and scratches. It’s made to last long. The battery is rechargeable and uses a micro USB charger. You can make calls to it because it also has hands free function. It uses Bluetooth 4.0 technology, it’s easy to pair with all devices. you can also use a 3.5mm audio jack cable to connect. They are very well designed. They are coated with a rubberized material that gives special durability and water resistance. It’s not just a story, they are really very durable. They have several buttons, more or less standard: switching on and off, sound volume adjustment, hands-free answering, etc. They are perfectly paired with other devices, very easy and very fast. On the bottom side, you have the ability to fasten it to a stand. People who tried this model say that they are almost the best in this category regarding the IPX7 waterproof level. This is very good if you plan to use your speakers outdoors, by the pool, river, lake, etc. They are not only waterproof, they are also snowproof, mudproof, sandproof, rainproof, dustproof, shockproof and that’s literally. It`s not going to be easy to damage them, even worse destroy them. Some people complained about the connection and the battery life. When you turn it on, you hear a very loud voice and you can’t reduce the sound of it. The sound quality is good, but the bass isn’t particularly strong. Everything is clear but there is no richness of sound. It’s best to test them and return within 12 months of the guarantee period if you have connection and battery problems. The customer support is great, so you shouldn’t have problems with this. Basically, everything depends on your expectations. If you want full, rich and engaging sound, the AOMAIS Sport II Portable Wireless Bluetooth Speakers 4.0 are the best solution for you. The sound is good, but it will not blow you away with these characteristics. It’s very well made, you have a warranty of 12 months. You can carry it with you wherever you want, it’s water-resistant and it’s very resistant to sand, dust, heat. This isn’t just a marketing story. Although these Bluetooth speakers don’t have extraordinary performance as far as the quality of the bass is concerned, we are sure that they will serve you for a very long time. These Bluetooth speakers differ from most others. They have extremely long battery life, up to 24 hours and connecting with other devices is easy even on the large distance of 66 feet (20 m). You can buy it in three colors: blue, red and black. It’s simply designed. It’s not ugly but it’s pretty simple. There are large letters with the inscription of the manufacturer on the front and on the back side. It uses a very capacitive battery that allows 24 hours of use with a maximal sound power of 80%. When you turn it on, you hear a sound indicating that it’s turned on. On the front, the light is on when you press the power button. We can say that this is a minimalist design. Connectivity is great; we can say it’s above average for these types of Bluetooth speakers. It uses standard, new Bluetooth 4.0 technology, as well as most other from this category. The difference is that this can be connected even from a distance of 20 m. On the side there is the input aux (audio 3.5 mm) and charging port, through the micro USB charger. Also, there is a built-in microphone. The sound is very good. Lows are very clean and everything works great. Mids are also good, vocals and instrumentals are great, with a bit harder sound details are lost, but nothing drastic. Highs are nicely solved. At the very least, there is little harshness, but everything is satisfactory. The people who have tested them in detail say that when listening to music with a strong bass, you can feel the air coming out behind the front grille of the speakers. The texture is very beautiful, as rubberized plastic. It’s pretty durable. It’s great to be able to use it for up to 24 hours of continuous music. A Powerful small speaker, although if you put it on the maximum volume you can hear a crackle with a certain type of music. You can also pick up a phone call with answering mode. Some people have complained that sound isn’t so good if you have a lot of walls between the speaker and the device from which you play music. Also, some didn’t like the sound quality, they say that the bass could be stronger. Essentially everything depends on what you expect. Anker SoundCore Bluetooth Speaker is very good. We can’t say that it`s the best in this price range regarding sound, but all in all, we like it. Sound quality is more than decent, it could be better bass, but still, it’s ok. The quality of production is durable and quite elegant. Its main advantages are very good battery life and great connectivity at a greater distance. Certainly a recommendation. Very attractive and practical design. This speaker is more intended for use outside. Specially designed for people who are constantly on the move, who run, walk, practice, go to work, etc. It has a built-in microphone. Bluetooth is 3.0 technology, which is quite ok. It’s well-designed. It provides about 5 hours of constant listening to music. The microphone is high quality. On the one side of this speaker you have three buttons, to answer and end a call, to turn on the speaker itself, which is in the middle, and to engage Bluetooth to connect to another device. On the other side, you have two buttons, to boost, that is, to reduce or increase the volume and input aux. It’s usually small. It has a carabiner clip, so you can easily attach it to your bag, jacket, backpack or any belt. A 3.5 mm jack cable is attached to the rear speaker itself so it’s a pretty nice thing. You can’t forget it, it’s always there with you. The reason why you have an aux output and a specially attached 3.5mm audio jack cable is that this gives you the ability to connect more of these speakers if you need a stronger sound. By creating a chain of speakers you can have a great party. You will not get a huge sound out of one but it’s a pretty decent sound. It’s very well made, quality materials are used. It’s simply designed, small in size. doesn’t need a lot of space even if you put it in your pocket. It looks really cool. It’s very lightweight. You can create a chain out of these speakers, if you need better sound, because you have an aux output, what’s pretty cool. You have a front indicator lamp that shows when the loudspeaker is switched on. It’s behind the front grille cover. High bass and a lot of loudness from one such a small speaker. Whenever you want to change or skip a song, just press the headset button twice. Switching over Bluetooth to other devices is very easy. Some people have complained about battery life. You have to consider a few things. At first, its price is very acceptable. It can fit into your hand without any problems. It’s lightweight and easy to move around even in your pocket. The sound is great for such a small speaker. Don’t expect a miracle and superb sound because when basses are maximized, little distortion appears. But, all in all, JBL Clip Portable Bluetooth Speaker is a great choice for you. The battery provides approximately 6 hours of listening to music. It takes about 4 hours to get fully charged. It has two speakers of 10 W. The subwoofer is located on the back, on the opposite side of the speakers itself. At the back, beside the subwoofer, there is a DC input (micro USB charging cable) and AUX. On the upper side, there are control buttons that are positioned in the shape of a circle with the power button, the volume adjusts + / – button, the button for selection of the songs and answering the phone. When you turn it on, a small, blue light goes on, and you also hear the sound of switching on. The bottom is rubberized, adheres and lies very well on any surface. Well made out of high-quality materials. It’s a little heavyweight. That’s because of three components: the speakers, subwoofer and a battery. Very good, high quality, sound. No distortion at highs. It’s equally good when you are near the speaker itself and when you are on the other side of the room. It’s a full range stereo sound. Two 10W speakers and 2 bass radiators really do a great job. Bluetooth technology is 4.0 so you won`t have any problems with pairing and connecting to other devices whenever there is a need. People who have tried this model say that it’s very well designed. Hard solid metal case. The speaker grille extends from one side to the other and is curved so that it occupies the three sides. Front side, left and right. It has easy access to control buttons on the top. The rubber pad located at the bottom is very practical because it’s good for a loudspeaker that gives a pretty strong sound and thus reduces the vibration it produces. Although it has a lot of weight, it’s portable, you can put it in the backpack or some other bag. The sound is really great, and this one is in the class of better models of Bluetooth speakers when it comes to sound quality. It’s equally good with all types of music. When you are not listening to music, but it’s turned on, periodically you hear a sound that alerts you to it. Some people are cool with this and some people consider it annoying. Some people complained that their battery life was too short. 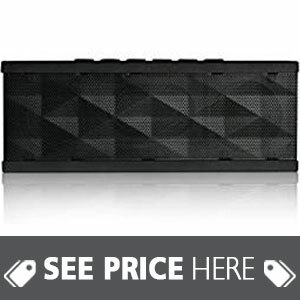 If you don’t mind its weight and size then this is a great Bluetooth speaker with great sound. You can really make a party with this and it sounds pretty good. 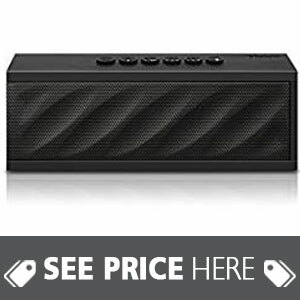 Great recommendation for this TaoTronics Bluetooth speaker. Excellent quality. Very resistant and robust. Suitable for use in very harsh conditions. It’s rubberized. The metal grille on the front is very strong and of high quality. It seems to be very resistant. It has a protective cover over AUX in, DC 5V charge and on/off button. On the top, you have Bluetooth button, volume up and down and skip and go back to a song buttons.When you press the power button (on/off) blue led lamp appears on the front, below the metal grille. It vibrates when you play music with a strong bass. It’s somehow industrial look but cool, of course, if you are a fan of rough looks. It gives a good grip when you carry it because of the rubberized part. Sound quality is more than great so it will suit for those who care about the sound, not the looks. People especially like that it’s really waterproof. The sound range is phenomenal. Of course, it’s not the best you’ve ever heard, but it really leaves the impression. It gives you confidence when you see what it looks like. It looks like those indestructible machines at the construction site, but in a positive way. Some people have complained about battery life when it’s maximally enhanced. 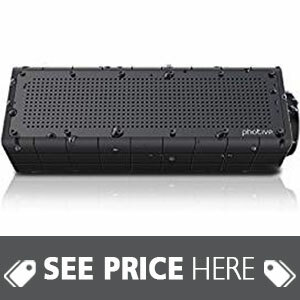 In our opinion, this model Photive Hydra Bluetooth speaker goes beyond of its price range in every aspect. Of course, if you like this design. It’s a great recommendation. It has unusual look, it’s square but with specially designed edges. It reminds us of a piece of military equipment. It’s quite resistant and provides a lot of things. It has an IP54 standard which means dust proof, splash proof and shockproof. It’s not completely waterproof but it’s okay. It can be bought in two colors: orange and army green. It uses Bluetooth 4.0 technology, easily paired with other devices even at distances up to 33 feet (10 m). Regarding control buttons, there is a power button, the button for resume and pause playback or end and answer phone calls. Volume buttons are different than most others because you have to hold them down in order to adjust the volume. Battery life is up to 12 hours at 80% of volume which is satisfactory for normal usage. It takes 2-3 hours to fully charge it which is quite fast if you need to reuse them again. This section is located beneath the protective cover. With this Bluetooth speaker, you also get a carrying strap. And that’s a high quality carrying strap. Don’t expect a miracle from these 3W small drivers. The sound is very good but still, 3 W. Highs can vary depending on the type of music. They are good but not the top notch. Mids are very good. Lows are decent, the bass isn’t very strong but quite OK to enjoy. What people first notice is that it’s really easy to connect with all devices. Almost immediately. The sound is great if you take into account its size. The sound is balanced, if you maximize the volume you have a little distortion but that is negligible. It’s made of quality materials so it will serve you for a very long. The battery is very good, it gets fully charged quickly and in no time the speaker`s ready to be used again. The sound is pretty good. Depending on the type of music you listen to it sometimes sounds better and sometimes a little worse, but altogether quite satisfactory. Some people complained they had charging issues. Very powerful little boy. You don’t expect it to be so good, but it’s really good. 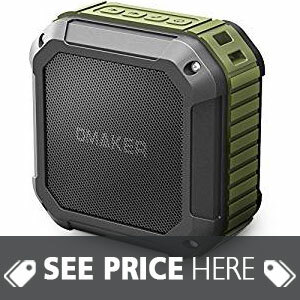 This Omaker M4 portable Bluetooth 4.0 speaker has everything you need, isn’t the best in every aspect but quite good. Be realistic, don’t expect too much but in this price range but it drew out attention and it definitely has a huge recommendation. The Sound is amazing. It can go really loud. The front grille is unusually geometrically designed, the material is very nice. This material is soft but it doesn’t attract fingerprints. The metal grille is a bit flexible, it can bend when you press it but looks very durable. On the top side, you have 6 buttons. Separate buttons for selecting songs and for enhancing the sound. Play and pause button and phone call answering/ending button.Very responsive buttons. For a portable wireless speaker, this one has two 6 W speakers which are quite a lot. Bass is respectable, highs are impressive, mids are very good. You have built-in AUX port but also wired connectivity. You can use it outdoor or indoor. Most people like it. It’s not expensive. The sound is pretty good. Some people say it’s missing more bass, but it’s satisfying. The battery lasts for a long time. When it’s paired with other devices, a woman’s voice is heard that informs you about it, some people find it cool, some other find it annoying, depends on the person. Generally exceeds expectations. It’s not waterproof so you have to watch out for water, rain, snow, etc. The SoundBot Sb 571 has a one year warranty, ability to use wired or wireless connection, good sound quality and relatively long battery life. Definitely stands out and it should be taken into account. Beautiful design and unique lighting rather attractive. In addition to the basic purpose, this model also has a LED light that changes in 7 different variants using 21 RGB LED lights. This Bluetooth speaker model has excellent sound quality. It uses a slightly older Bluetooth 3.0 technology, but connecting and pairing with other devices is smooth. It has a very compact design, the materials are excellent, very soft to the touch. Rubberized surface helps to protect it from slipping from a flat surface. The battery is 800mAh and provides 5-6 hours of music listening continuously which is quite satisfactory. The sound is pretty good and it’s strong enough even for a slightly larger room. Built-in LED bulbs, in fact, 21 RGB LED lights provide the possibility of pulsing in 7 variants following the rhythm of the music. It has two dual voice speakers, deep bass, treble is bright and sounds very good. The control panel is well-built, easy to use. The wireless range is up to 31 feet (about 9 m). People who used these Bluetooth speakers like it very much. The sound is very clean. You have 7 modes to adjust the light. It’s very nicely designed, the metal grille is smooth, not only as a decorative but also a protective detail. It’s very well made in general. Not slippery because of the rubber. It also has a built-in microphone. It quickly connects, within 3 seconds with nearby devices. When you turn it on, you hear a woman’s voice saying that it’s turned on and then immediately switches to pairing with the device. There’s not a lot of bass in it but just enough to enjoy it. Some people complained about transmission range. You need to be close to the speaker in order to have clear sound without breaking. If you don’t have great expectations, all in all, it is awesome. Especially these LED lights. It gives it a special charm. Everything about this URPOWER Hi-Fi Portable Wireless Stereo Speaker with 7 LED Visual Modes is more than ok but it’s not going to blow your mind , be realistic and you’ll be very satisfied. We liked its design. It’s not very flashy but the main thing is the sound quality. This model has 10W drivers that provide great sound quality. It has a grille on three sides, other parts are covered with soft plastic. Buttons are located on the top of the speaker and they are made of soft rubber. Very responsive. Although it attracts dust this rubber cover makes it very durable. As long as you stay in the range of 30 feet (around 9 m) you won`t have any problems with connection. The built-in microphone is OK. Battery life is 10 – 12 hours depending on volume which is long. Sound quality is great. Highs are little harsh but nothing serious. Mids are good, especially vocals. Lows are actually very good. It’s available in 3 colors: red, black and blue. This is actually an upgraded version. It’s better than the previous one because some of the flaws have been fixed. You have 6 buttons. To amplify and reduce sound, play/pause to skip/rewind and to answer the phone. Very durable. Metal grille is of high quality. Doesn’t look cheap at all. Base pad is actually very useful because if you don’t put it under the speaker than it will move because of the vibrations. Audio is very clear, it’s loud and the bass is like on some much more expensive models. Some people didn’t like the dust magnet characteristic. Because of the rubberized surface, it attracts dust. It’s beautifully made. The design is attractive and solid. Bass is decent, easy to connect, battery life is good. It’s not for large rooms, but in a small room, it’s fantastic. Great recommendation for DKnight MagicBox II. How to choose your best cheap Bluetooth speakers under 50$? You have a huge number of different Bluetooth speakers on the market. Choosing the right model isn’t easy. The most important thing is to be realistic about your expectations. You need to synchronize the amount of money you are ready to spend and the quality you are expecting to get. You can’t expect a Bluetooth speaker, which is cheap, to offer the same quality and features as expensive Bluetooth speakers. 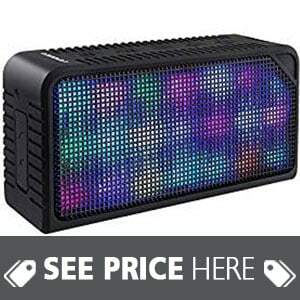 However, today’s manufacturers are working hard to satisfy all the needs of customers, so in this category, you have high-quality Bluetooth speakers that are pretty affordable. Depending on how you intend to use it, the choice of the right one is on you. If you intend to use it both inside and out, then you need to look for a model that is more durable. The one that is water-resistant, shock-resistant, dust-resistant, etc. They are made of different materials. Mostly of high-quality plastic that is often coated with rubber. The design is a special thing. You can choose whatever you like and there is a great variety of models to choose from. Each and every model meets the basic criteria. But there are those who have better sound, stronger bass, cleaner sounds, etc. The best option is to tailor it to your needs and of course your lifestyle. That way you will most easily get the ideal model that suits you. If you don’t expect a miracle then each of these Bluetooth speakers will be great for you. They are better than any speaker on any device you connect to. That’s for sure. It’s hard to believe that the sound on your phone can be better than the sound coming from one of these Bluetooth speakers. They are portable you can carry them wherever you go. Really nice little thing which could bring you a ray of enjoyment in life. 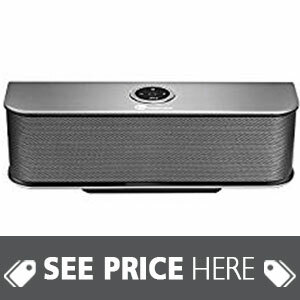 Which Bluetooth speaker should I buy? This is a personal question. It depends on you. If you have an active life, if you spend a lot of time outdoors, you should definitely choose a very durable model made of durable materials. It would be good to be water resistant, dust resistant, shock resistant, heat resistant, etc. If you are a quieter type and spend most of your time relaxing in some indoor space then you can look for a model that is very well designed and focused on the sound quality it provides. 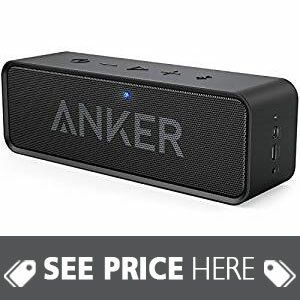 What is a good quality sound on cheap Bluetooth speakers? Not every speaker is the same. some are stronger, some are weaker. Some have a strong bass some have a weak one. Depending on the type of music you listen to, depends on the sound quality you need. It’s not imperative that you have a strong bass if you don’t listen to music that needs enough of bass. That’s the essence. Definitely yes. Some models you may not like as you expected, but each one will be much better than the ordinary speaker on your device that you already have. Based on the quality of materials from which they were made, sound quality, price and quality ratio, portability, etc. 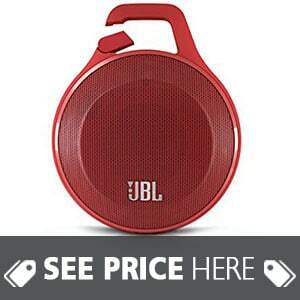 our favorite product in the “Best cheap Bluetooth speakers under $50” category is the JBL Clip Portable Bluetooth Speaker. It has everything you need from a Bluetooth portable speaker and it has a lot of charm.